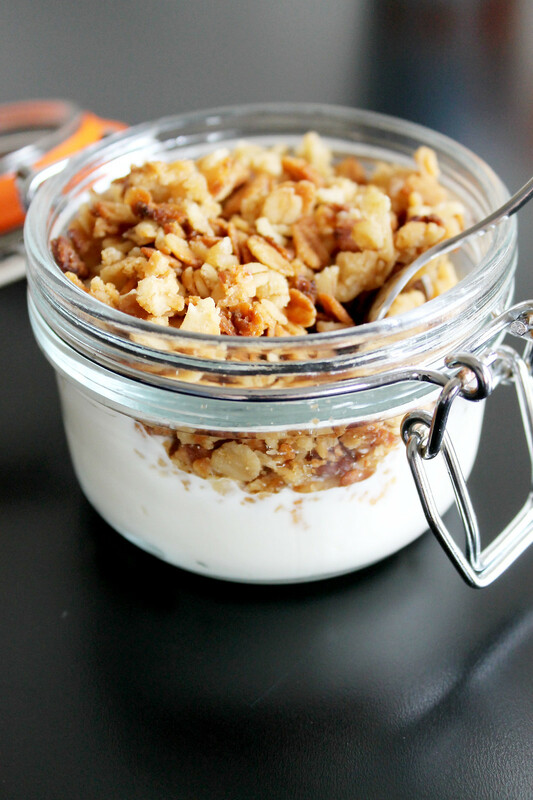 This recipe for Apple Granola is a bit of a break from the norm here in that it’s possibly the most unhealthy recipe I’ve ever posted. It is wheat free though (clutching at straws!). In the unhealthy, reserved only for special occasion stakes this chocolate cake might just pip it at the post. 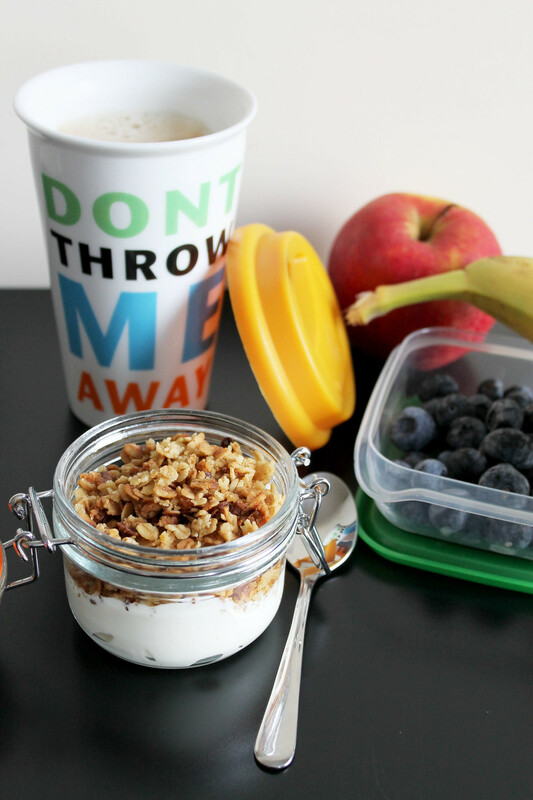 I do love a nice granola and there’s a much healthier version over here if you are interested. A couple of weeks ago I had a bit of a sugar craving and a surplus of apples so I decided to make these apple flapjacks. The BBC good food site is a favourite of mine, as are their magazines, the recipes are really well tested and taste amazing. This recipe however may also be known as – ‘What happens when good recipes are followed by bad people’ or ‘Should have been flapjacks but turned into Apple Granola instead’. I wasn’t going to post at all but to be honest I’d been having some disasters in the kitchen of late (too many cakes not tasty enough or pretty enough to blog) but this tastes so good, I’d recommend you try it. I’ll confess that for someone who is so obsessed with cookbooks, food blogs and magazines that I’m not that great at following recipes. I am constantly adjusting, forgetting to add things, improvising on the method to make it easier or healthier etc. Fortunately things tend to turn out ok in the end, even if they don’t resemble what I was supposed to be making in the first place. Obviously this recipe is not healthier at all but it did end up as Apple Granola instead of Apple Flapjacks. That’s ok though, it tastes like dessert for breakfast and that’s only a good thing right? It does come with a health warning though – this is not the kind of thing you should eat regularly, best kept for occasional treats. At the very least keep the portions small, your heart will thank you! Recipe inspired by: this one on BBC Good Food. Preheat your oven to 180C. Grease a large baking tray, I used a large rectangular baking tray, about 13in by 9in. Melt the butter, sugar and syrup together over a medium heat, stirring occasionally until the sugar has dissolved. Peel and grate the apples while you are waiting. 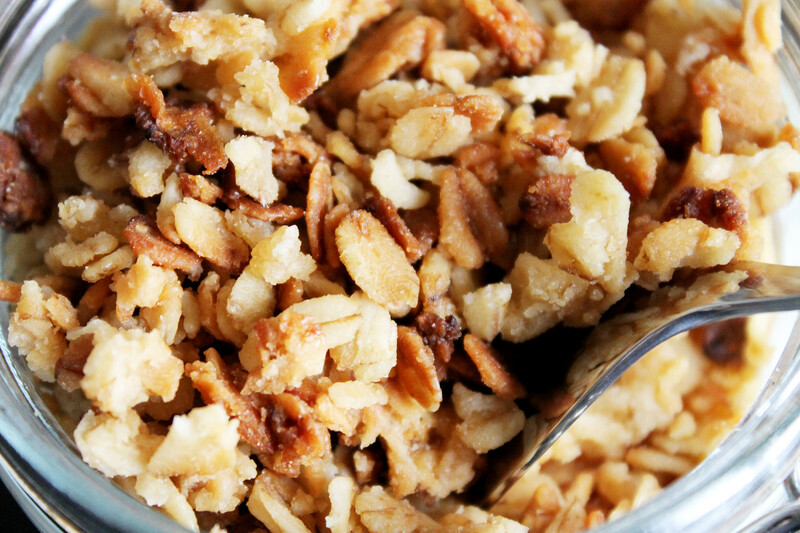 In a large mixing bowl, combine the oats, apples and syrup mixture. Place it into the baking tray, pressing it lightly so that it spreads out evenly. Pop in the oven for 20 minutes. Here’s where I deviated from the original recipe. After 20 minutes it was still very moist – quite possibly because my apples were large. Using a fork I broke up the mixture at this point and placed it back in the over for another 30 minutes, taking it out every 10 minutes to mix it up again to get an even toast. 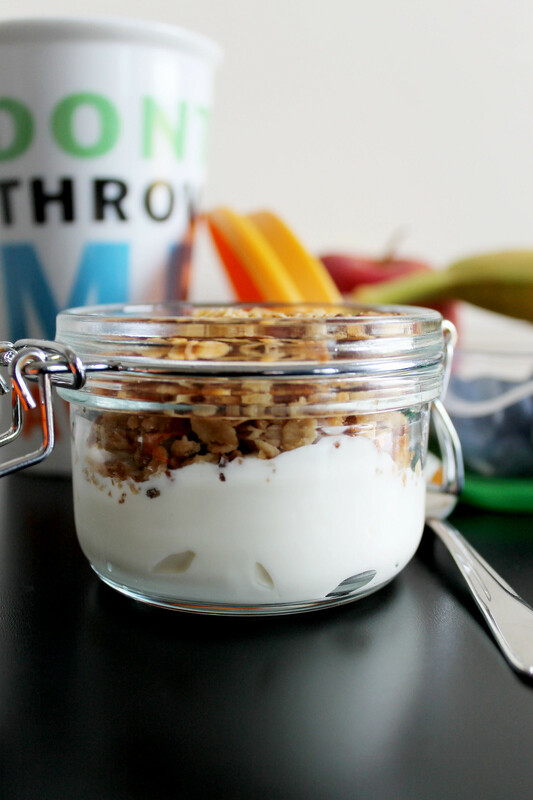 Serve with fruit and yoghurt.